As December inches closer, the first ever FLYTIME MUSIC FESTIVAL is set to kickoff Day 1 with the 14thedition of the most anticipated concert of the year, “Pepsi Rhythm Unplugged”. Having set and maintained the standard as the biggest music showcase platform in Nigeria for over a decade, Pepsi Rhythm Unplugged returns with unquestionably the biggest line up of artists and surprises yet. Confirmed to deliver a night filled with out-of-this-world thrills and energetic excitement, Flytime Promotions is proud to announce the star-studded line up for Pepsi Rhythm Unplugged. The night will feature performances by music heavyweights like: Tiwa Savage, Burna Boy, Olamide, Dbanj, Wande Coal, Falz, Duncan Mighty, Teni the Entertainer, MI, Mayorkun, Peruzzi, Slimcase, Victor AD and more. To ensure good vibes, Nigeria’s top DJ’s including Dj Obi, Dj Cuppy and Dj Neptune will be on the 1’s & 2’s. Known to constantly take concertgoers to a different level of excitement, get ready for loads of surprise appearances because “Anything Can Happen”! This event will be happening live at the Convention Centre of the Eko Hotel & Suites, Victoria island, Lagos, on the 21st of December 2018. 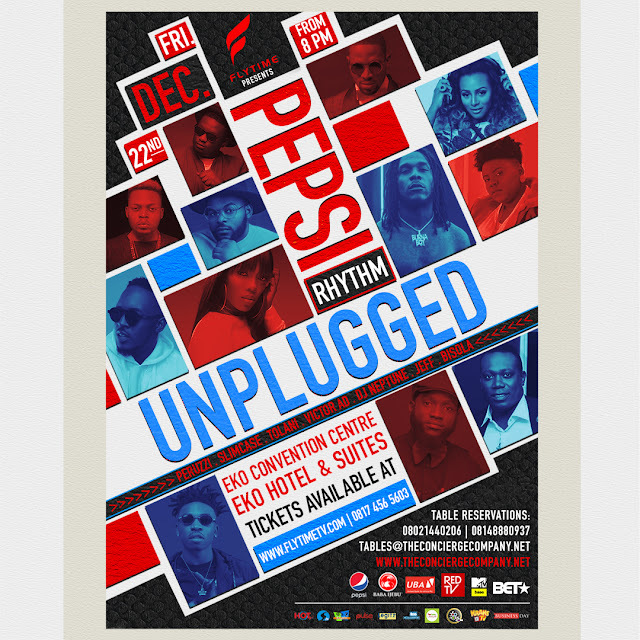 The “Pepsi Rhythm Unplugged” is sponsored by Pepsi, Baba Ijebu, Redtv, UBA, MTV and BET and supported by Hot FM, Silverbird TV, Rhythm, Pulse, Legit.ng, Tooxclusive, Kraks, The Cable Lifestyle, 360nobs.com, Business Day.